For all of you who wish to experience the magic of fairy-tale-like castles transported into the 21st century, here’s an amazing fact: according to the National Heritage Institute, there are a whopping 932 castles in the Czech Republic, in addition to 1187 chateaux, all surrounded by forests, gorgeous gardens, fountains, and sculptures. The majority of these structures have been renovated and are well-maintained. Most of these are museums now. Others were converted into different types of establishments, such as hotels, restaurants, wedding venues, golf courses, etc. The rest were, unfortunately, ruined. 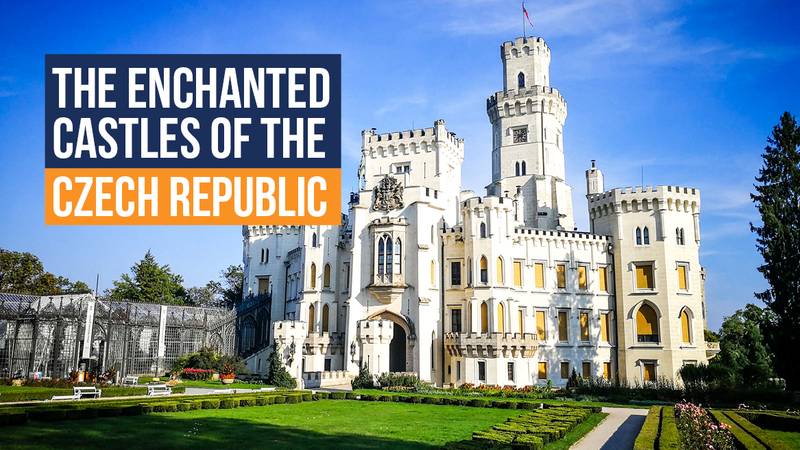 Let’s check out the five castles we’ve chosen as the starting point for your enchanted castle adventure while on an escorted tour to Eastern Europe. Interesting fact: all of the castles below were used as filming locations for many famous films. We start with a beauty! Bouzov Castle is a national monument surrounded by greenery, built on a hill near the town Bouzov in the early 14th century. Besides the castle, there are towers, bastions, battlements, and structures adorned with oriel windows, loopholes, Gothic vaults, and a clock, all placed in horseshoe form. Its neo-Gothic chapel, Gothic altar, and the tombs are extremely valuable and popular, as well as an eight-story (58m) high watchtower, and the amazing two long bridges across the moat, with a short drawbridge at the end. Bouzov Castle offers day and evening tours, as well as costumed tours. You can explore the rooms of the castle, such as the knights’ hall and the knights’ chambers, and see the valuable furniture from the private collection of Eugen von Habsburg and that of the Order of the Teutonic Knights. Near the village Sychrov, you’ll find a marvelous, unique example of Neo-Gothic architecture. Originally a small, ruined Baroque castle, the first reconstruction of Sychrov, commissioned by the French family of Rohan, was finished in 1834, and the second in 1862 during which the structure received its neo-Gothic elements, while the wonderful Castle Park was designed in the English style, achieving a rare harmony of castle interior, exterior, and the park. The castle houses the largest collection of French portrait paintings in Central Europe – around 250 portraits of the Rohans, related families, and French kings, as well as the unique glass paintings by Jan Zachariáš Quast, and the valuable interior carvings by Petr Bušek. The park is home to many splendid dendrological and botanical collections, as well as a unique beech (Fagus silvatica Rohani). You can go on day or evening tours, see the falconry displays, enjoy concerts, or come in August for the popular Scottish games. One of the most gorgeous and best-preserved castles in the country, Pernštejn Castle was built between 1270 and 1285. It proudly stands on a rock above the village of Nedvědice and the rivers Svratka and Nedvědička. In the first settlement, you’ll find the gate protected by the older fortifications from the early 1500s, as well as several outbuildings, a Renaissance bastion with a gate, a Baroque bridge, and two ramparts, followed by the gate of the second settlement with Gothic-Renaissance marble portal. The second settlement and its barbican complex are surrounded by a moat, across which a stairway leads to the terrace garden. There are many more Gothic and Renaissance edifices, bridges, towers, chapels, etc. for you to see, decorated with stuccowork, fresco paintings, Baroque ceilings, Rococo ornaments, and dozens of inscriptions in Czech, German, and Latin. This gorgeous enchanted castle is a National Cultural Monument of the Czech Republic. It rests in Hluboká nad Vltavou, surrounded by a large (190 hectares) English-style park. The first Gothic castle was built here in the 13th century, then expanded during the Renaissance period, then rebuilt into a Baroque castle in the early 1700s, and finally gained its current Tudor-style, Romantic Neo-Gothic form in the mid-1800s, when it was reconstructed in the Romantic style of England’s Windsor Castle. You can see a myriad of wonderful things here, from the architecture, the park, the winter garden, numerous objects d'art, paintings, and tapestries from the 17th and 18th centuries, as well as the riding-hall, which has been home to the Southern Bohemian gallery exhibitions since 1956. This unbelievable 12th-century Gothic castle stands on the massive rocky promontory, surrounded by the lovely river Ohří. Since the castle sits in the middle of the charming town Loket and has a tower that is twenty-six meters high, excellent views are guaranteed. Today, Loket Castle is a museum and national monument, divided into nine sections housing many medieval artifacts. You’ll find here the Margrave’s House, home to an exhibition of porcelain and the remains of a Romanesque rotunda, and you’ll see the Baroque Cathedral, a Romanesque prismatic tower, the historical arms and Archaeological hall, the wedding and the ceremonial hall, the prison cells and the chamber of torture, the 15th-century burgrave’s house and the captain’s house, and a 16th-century palace with two wings and fortifications with strongholds.